Immunizations are available for persons of all ages. Immunizations clinics are held on the 2nd Tues. & Wed. of each month. If that does not work with your family’s busy schedule, we will try to accommodate you. Walk-ins are always welcome, however appointments are appreciated. Red Willow County Health Department is a provider for Aetna, Midlands Choice, Medica, Blue Cross/Blue Shield & United Health Care for children & adult vaccines. Medicare can also be billed: (Medicare Part B-covers Flu, Prevnar & Pneumovax) & (Medicare Part D-may cover Shingles, Hepatitis A & Tdap). Free immunizations are available for children & adults who qualify through the State Health Department Programs. For more information, please call our office at 308-345-1790 or Toll Free 1-877-250-2057. 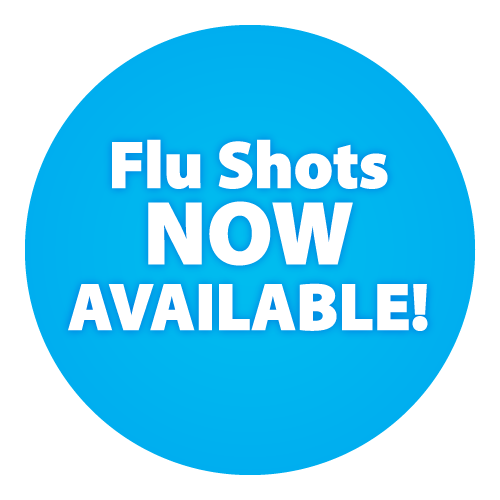 Flu shots are given annually. Please call for an appointment. We are a provider for Aetna, Blue Cross/Blue Shield, United Health Care, Midlands Choice, Medica and Medicare Part B. If you do not have insurance, we have state funded programs for those who qualify so “everyone can be protected”. The incidence of pertussis (whooping cough) is on the rise. The CDC recommends all adults get vaccinated, especially those who will be in contact with a newborn baby. Lab screenings offered include Chem/Lipid Panel, TSH, A1C, Vitamin D Level and PSA testing. Lab draws are offered the 2nd Thursday of every month at low Health Fair prices. Bi-annual Health Fair offered in Spring and Fall. Call for appointment. Fee required. Walk-in Blood Pressure Clinics are held Thursday, 1:00-3:00 pm, in our office at the fairgrounds. Other times are scheduled at various locations in McCook. First Wednesday of Each Month: Red Willow County Courthouse 10:00-10:45 am and McCook Heritage Senior Center 11:00-11:45 am. Last Tuesday of Each Month: Sehnert’s Bakery 9:30-10:30 am. Appointment necessary. Please call for information. Fee required. Testing kit and related health information is available at no charge. Appointment required. Please bring your own basin and towel. Fee required. Children and adults are eligible for lead screening. The test involves a finger-stick blood sample. Nominal fee required. One time courtesy visit by our public health nurse offers education, support and information for new parents. Please call for an appointment. 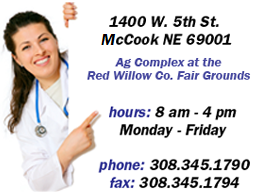 Red Willow County Health contracts with outside agencies as a collection site for court ordered testing. Assist with area school health checks. Please call for more information. Kristen Puckett, RN, leads a low impact, sitting or standing exercise program on Tuesdays & Thursdays. East Ward Village 11:00-11:30am. McCook Heritage Senior Center 12:30-1:00pm. Referrals and assistance in finding additional health resources provided. Please call or stop by anytime. The purpose of the Red Willow County Health Department is to disseminate health information and specialized services to our citizens, with a focus on health promotion, disease prevention and support for those diagnosed with a chronic health condition.